It's good just the way it is â€” don't touch it!" is the rabid response of many classic sci-fi fans. 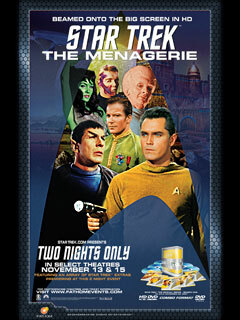 Yet just as George Lucas revisited his Star Wars, the original Star Trek is now also being remastered. As a special promotion of that project's results, "The Menagerie", a forty-year-old two-part episode, was screened this Tuesday and Thursday nights at select theaters nationwide. I reserved my tickets five weeks ago, and this Tuesday, I finally, eagerly took my seat. The evening opened with a brief introduction by Rod Roddenberry, who reminisced on Star Trek's genesis and his father's efforts on same before sequeing into a brief overview of the TOS remastering effort. Some of this featurette I'd already seen on StarTrek.com, yet I wished it had run longer. In hindsight, I don't know how it could've without expanding its scope to celebrate all of Star Trek — but isn't that why we were all there? "All" wasn't as many as I expected, though: I was surprised and disappointed by how not sold out the show was. Only one person represented Starfleet in full uniform (TNG era, but so what). Nonetheless, even if they didn't wear their geekery on their shoulders, it was comforting to share the company of those discussing the finer points of Trekdom while enjoying this morsel to hold them over until next year's film release. "The Menagerie" is a repackaging of "The Cage", a rejected first pilot for Star Trek. I'd seen "The Menagerie" before, but not recently enough to recognize exactly what special effects were changed. Whereas only a veteran of the series might pick up on minutia, the delineation between old technology and new can otherwise be garishly blunt to the uninitiated. From that latter perspective, I observed nothing out of place; all the special effects were seamless. Plotwise, we amused ourselves by spotting various inconsistencies, back when there was no continuity to be inconsistent with, such as Spock grinning with amazement at observing the local flora. Majel Barrett, who would later play Lwaxana Troi, Nurse Chapel, and the voice of the computer on all six series, here plays the first officer — though in just one episode, she didn't have the same opportunity to develop this character. Other character moments were also fun, such as Bones' propensity for sudden and passion speeches. It capitalized for me that, despite all the marvels, wonders, and tragedies the crew of the Enterprise encountered, they never became inured with it. Perhaps, in Roddenberry's vision for humanity's future, it's that sense of wonder that propelled us to the stars, and not vice versa. I enjoyed going back to those days of the "first" Star Trek Enterprise actors and reflecting on just how well they did acting and especially with the technology of the times for their special effects. As I said yesterday, "Gene Rodenberry was the Galileo and Jules Verne of our era all wrapped up in one." Going where no man has gone before is always more enjoyable with a friend especially when that someone is your son. © Showbits 2006-2019. Showbits powered by WordPress.